The flight attendant is magnificent. a cockeyed pillbox. The rapture in it. then a wand of lip gloss, battening down. She is Jell-O and Bonnie & Clyde. She is pink martinis. She is Frigidaire. into a four-point and tugs her skirt. Monica Kidd is all eyes-wide-open observational. These snare drum tight poems are as crisp as winter weather. It's almost too easy to say, seeing that Kidd sidelines as a doctor, but these poems read prescription clear, only what is necessary. And then, just when you think that is true — it isn't. The journalist/reporter/researcher head of the multi-faceted Hydra that must rest where most of us have a noggin' rears into its' voice with a depth of compassion and moral certainty rarely squeezed out of poems. This is a very fine set of parlour tricks that Monica Kidd has at her disposal but she never wastes them, or lets the reader down. Poem after poem her sure-footed voice strikes the right note and the result is flat-out hard-nosed excellent poetry. Like trying to stop gravity. towels. Packed him full and taped him down, hard. spreading over a sheet. Someone whispering. Couldn't afford the time off work to get the surgery. A sick wife and a kid at home. The way he died because he was poor. Monica Kidd is not shy but she sure can dig into those difficult places people don't want to discuss. "Instructions for disposal" is but one of a dozen jaw-dropping slaps to the senses. on this stone and that. There are love poems in here as well, in fact it might be all love poems. (Any Other Woman: An Uncommon Biography) and a collection of poetry (Actualities). 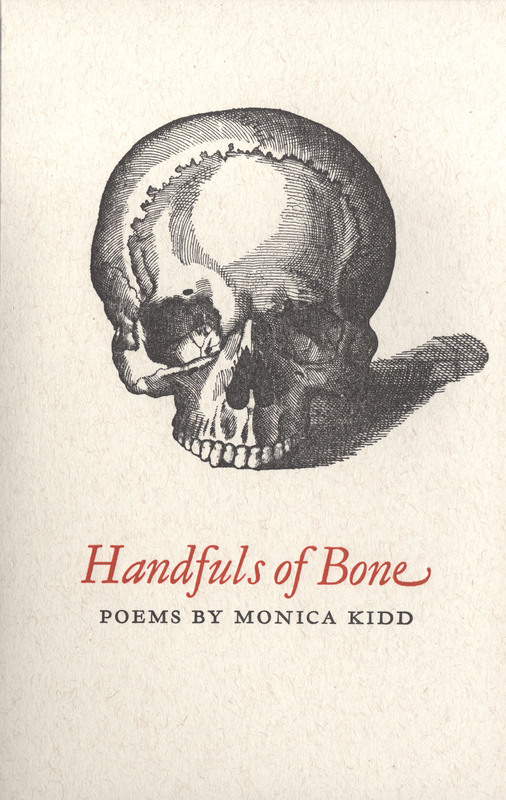 Handfuls of Bone is a book you WILL enjoy. This particular book another example of why Gary Dunfield and Andrew Steeves are known for the most attractive books in the country.